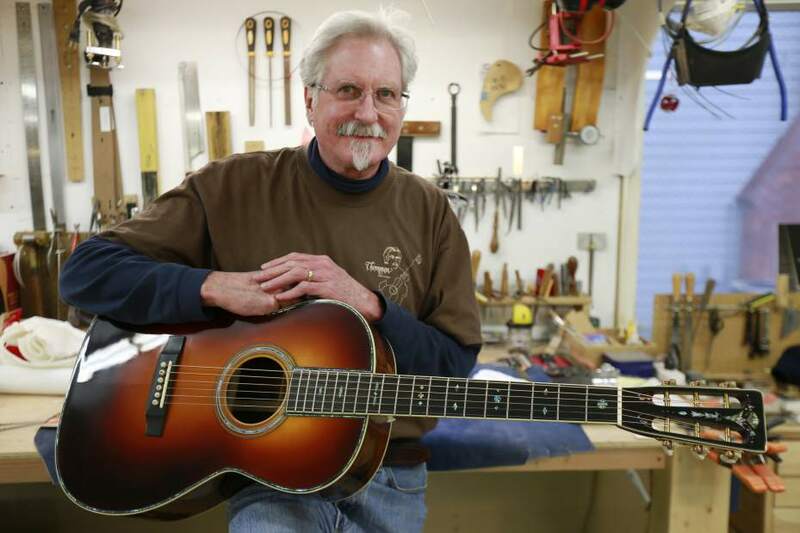 In the year 1986 Preston Thompson, master luthier at none other than Thompson Guitars in Sisters, Oregon, built a very special dreadnought with 42 style appointments for a fabulous flatpicker. Who was this 42 style dreadnought with Brazilian rosewood back and sides made for? In 1986 Preston Thompson's friend, incredible flatpicker, and member of the bluegrass outfit Hot Rize, Charles Sawtelle, sought out a 42 style dreadnought. Preston was the man to build it, and the two used Sawtelle's collection of vintage Martins to investigate the build process of guitars made in the 30's also known as the golden era. Charles' guitar has a German spruce top, Brazilian rosewood back/sides, green heart abalone on the top purfling, and red abalone for the snowflake fretmarkers & torch headstock inlay. All of the internal bracing, neck dimensions, and neck profile of this 42 style Thompson guitar were based on Charles' 1937 Martin D28.